To celebrate the new apple season, we teamed up with 5 top food bloggers for the Waitrose Brilliantly British Apple Recipe Challenge. 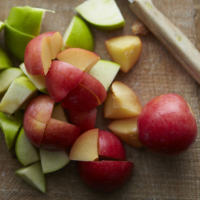 They've created some brand new apple-based recipes which we know you'll love. Kavey from kaveyeats.com shows us how to cook a delicious apple and ginger chutney. 1. Sterilise jam jars and lids. I boil the lids and sterilise the jars in my oven. 2. Cook the diced onion and cider vinegar in a saucepan over a medium heat. 3. Once the onion has started to soften, add the diced apples to the pan. (You can peel, core and dice the apples once you've put the onions on to cook). 4. Next add the brown sugar, the syrup from the stem ginger jar and the all spice powder and stir well. Continue to cook on a medium heat. 5. After the sugar has fully dissolved, add the chopped stem ginger. 6. Once all the ingredients are fully combined, do a taste check and adjust sugar or vinegar if required, to achieve your preferred balance of sweet and tart. 7. The texture is down to your preference, though you will need to cook until the liquid is reduced and the chutney comes together. I usually cook the chutney until the onions are soft but the diced apples retain a little shape. This can take anywhere from 15 to 30 minutes. 8. You can serve this chutney fresh if you wish, but I recommend transferring the hot chutney into hot sterilised jars and allowing it to mature for at least 3 months.